What is an “Invitation to Bid”? What is a “Bid Proposal”? How do you build a project team or hire subcontractors? In the construction trade, career advancement and getting the knowledge and confidence necessary to gain educational experience can seem impossible. Now Turner Group Construction has made information accessible for all in one simple resource. 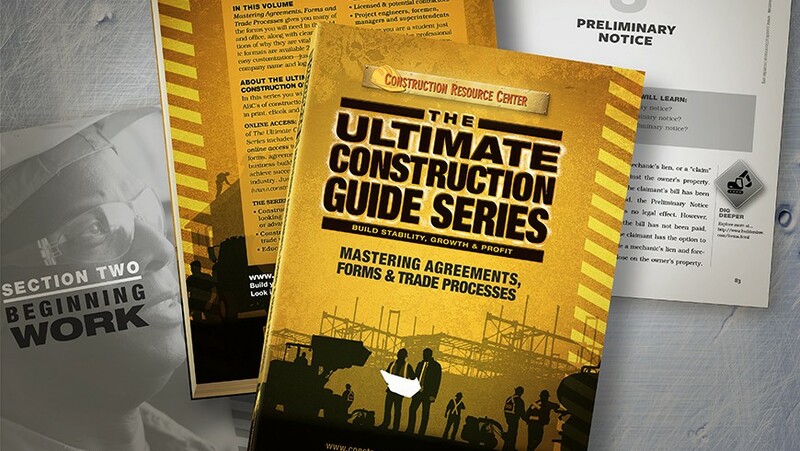 From dealing with government bureaucracies to dealing with employee time sheets, The Ultimate Construction Guide Series offers the building blocks for running a construction business. Publishing is highly demanding at the best of times. A resource book of this type is even more challenging. Design Corps was asked to help not only in the design of the cover and interior but also with managing many of the graphical elements that needed to be developed both for call-outs and side-bars as well as for hundreds of sample documents. We were asked to design the cover with one concept in order to keep design cost as low as possible for the client. The same with interior design. Page composition is usually an exercise in first fleshing out the document using the interior design (to produce 1st pages) followed by two or three cycles of proofing and corrections. In this case the client needed to use the page composition phase to see that more text was needed for their book, making the 1st pages a sort of test run. In the end, we felt our experience greatly helped a company new to publishing to achieve their dream, and, in the process, we were able to teach some valuable processes and methods of preparation so that the journey may be smoother next time. As stated above, the book is a powerful tool for helping beginners to learn the trade. With each chapter containing additional resources of tips, links, samples, and warnings, the book is a well organized resource—just as the authors envisioned when they began their process.